The Columbus Blue Jackets may not be all that great of an NHL team, but they do have a very promising core of young players and prospects who could play significant roles for the team in the near future. The Jackets are no strangers to shocking moves – passing on Puljujarvi for Pierre-Luc, anyone? – or trading youngsters – two of their three 2014 1st round picks have already found new teams – but there is a lot of optimism surrounding the team’s future. 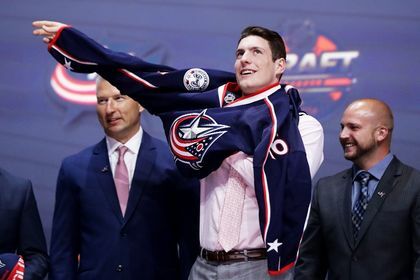 Columbus has no fewer than three prospects who could graduate to full-time NHLers this season, with a few more who already have NHL games under their belt, or should see some NHL action during 2016/17. There is some high-end potential at both forward and defense. Plus, with goalie Joonas Korpisalo already performing excellently in a limited stint as a starter during this past year, it rounds out the team’s prospect pool quite nicely. Pierre-Luc Dubois may have been a surprise pick at #3 in the 2016 draft, but he was arguably the fourth best prospect available and is a big, strong power forward who put down the second best primary points per game rate among CHL draft eligibles. It was heavily rumoured that CBJ would target a C with their pick, and in Dubois they’ve found that – sort of. Before this season, Dubois had never played the position, and in fact, he only began taking face-offs partway through the 2015/16 season. That said, he has already shown skill at the position, with a win-rate above 50%. He is not likely to make the team out of camp, but another dominant season like 2015/16 and that could change next season. Oliver Bjorkstrand already has a Calder Cup MVP to his name, plus registered 8 points in 12 NHL games for Columbus, and is a frontrunner to make the team out of camp. Sonny Milano and Vitaly Abramov are oozing skill. Milano already has a full AHL season under his belt before the age of 20, plus a short NHL audition towards the end of the season. Abramov finished fourth in even strength scoring among CHL draft eligibles. Elsewhere, Daniel Zaar is a sniper in training and put together 21 regular season and 7 playoff goals for Lake Erie in his first year in North America. The team also has depth options. Josh Anderson is another candidate to become a CBJ regular this season in a fourth line role. Players like Hannikainen, Maletta, Kolesar, or Bittner may not have much offensive upside at the NHL level, but all could develop into bottom six NHL forwards in the future if they can maximize their current skillsets. The defense isn’t quite as deep as the forward group but still has bright spots. Zach Werenski is clearly the top prospect in the organization. The 18-year-old had just a single point in his first 7 AHL games, but dominated in the playoffs, with 14 points in 17 games, and was the best defenseman on the team throughout the Calder Cup Final. He is likely to make the Blue Jackets out of camp as a 19-year-old. After that, though, it’s a bit murkier. Dean Kukan might be able to carve out a role as a bottom pairing option. 2014 2nd rounder Dillon Heatherington, 2015 1st rounder Gabriel Carlsson, and 2016 2nd rounder Andrew Peeke are all big-bodied defensive defenders with limited offensive upside. Markus Nutivaara is an intriguing prospect who showed massive leaps in development in his second season with Karpat in the Finnish Liiga, but hasn’t played a North American game yet. Outside of Werenski, it’s hard to see any of this crop of defenders becoming impact options at the NHL level. Maybe there’s a third pairing player or two in here, though. Both Korpisalo and Forsberg already have NHL experience to their credit, with Korpisalo’s going swimmingly, while Forsberg faltered. Korpisalo played 31 mostly excellent games in Columbus, where he was ninth in the NHL with a 93.4% even strength save rate. That run has many fans already anointing him as the heir apparent to the seemingly always injured, $7.5 million per year, still-in-his-prime Sergei Bobrovsky. That’s probably premature, but his performance is promising. Forsberg has struggled in his NHL stints thus far (89.5% even strength save rate in 330 minutes spread over two seasons), but went 9-0 with a 94.9sv% in the AHL play-offs and really improved his standing in the organization. Dansk was terrible in his only North American pro season and is now back in Sweden. Elvis Merzlikins was one of the top goalies in Switzerland’s NLA, but re-signed there for three more years, without an NHL-out clause. Thome was drafted in 2016 as a second-year eligible and hasn’t played at a level higher than the NAHL. He’s a long-term project at best. But having two nearly-ready NHL options out of the goalie pool is a very strong position to be in.